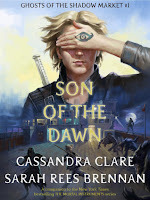 Son of the Dawn by Cassandra Clare and Sarah Rees Brennan. The boy’s glance up at his face was shocking, the flare of twin suns in what was still almost night. They were not the eyes of a soldier, but a warrior. Isabelle loved her big brother, but sometimes she despaired about their future demon-hunting endeavors. He was so bad at remembering her cool military-style signals. The saying concerning growing with its tasks might primarily refer to character (and possibly the liver) but I’d also say that the heart grows with its tasks. Not in actual size, mind you, as that might soon become rather problematic … you know what I mean. However, no matter how many additional Shadowhunters and Co. will find their way into my reader’s heart, the original TMI (and TID) cast will always, always have a special place there. It was really neat to catch a glimpse of Mini Alec, Jace, and Izzy before all the horribleness actually catches up with them and already get a whiff of the people they’ll grow up to be. Clearly, a well-honed sense of irony/sarcasm like Jace’s has to be grown organically and the roots are clearly already visible in his ten-year-old self. As are the beginnings of Izzy’s fierceness and independence. That leaves the matter of the “punched right in the feels” parts of the framework. I really shouldn’t have been surprised, especially not about the tearjerker right at the end. But there I was, silently sniffling in my tissue (because I have at least – finally, you might say – learnt to keep those with me when I read my favourite heart-wrecking authors). I’m extremely happy that there will be shorts about the Shadow Market and its surroundings coining out every month now leading up to the publication of Queen of Air and Darkness. The previous cooperation stories have been a total delight to read and I think these will be up to the task in terms of entertainment value and tear-levels. If you were to choose a glimpse into a favourite character’s undocumented past, who would it be and which defining scene would you like to read about? Share your ideas and teasers in the comments! Like Laura - I can't think of anyone in particular, but I'm sure it will occur to me at 3 am... Thank you for sharing.